As a victim of April 10/11 student protest myself, I couldn’t be much prouder with all those who took part in yesterday’s protest in Washington, DC. Even though we know the protest will not bring back those who lost their lives, however, it is fitting to say that they have not been forgotten at all especially by the Diasporas. We can’t name names, but we can say job well done to everyone and this is the only way we can bring about meaningful change in The Gambia and eventually justice for the victims. 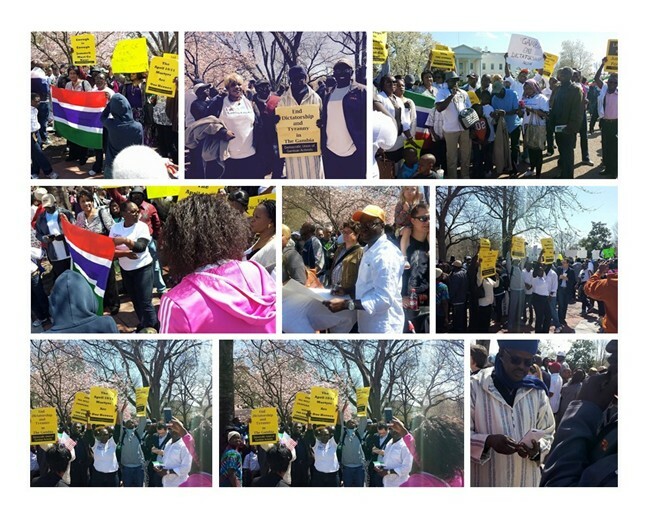 It is rather disappointing to say the least why no body in The Gambia especially the opposition parties dares to lead a protest march in seeking justice for the April 10/11 victims. If Jammeh and his bandits can organise a solidarity march on behalf of his diabolical and thuggish administration why can’t the oppositions organise and lead a solidarity march on behalf of our fallen comrades? If the oppositions genuinely put The Gambia and her people first before any personal gains, without a shadow of a doubt things would have been different by now, but for them sadly, personal gains take precedent over the country’s interests. Meanwhile, we shall continue to fight till our last sweat and blood for every victim of the vicious and barbaric brutality of April 10/11, 2000. You shall never be forgotten till we meet again comrades. REST IN PEACE!! !